In the beginning of this week I once again found myself in Östergötland County, this time on a road trip. One of the places I visited was Skärkind, a small place along the Kings road (Eriksgatan). The kings road was really more of a route that a newly elected or proclaimed king had to take to be accepted as king through the realms during the early middle ages. 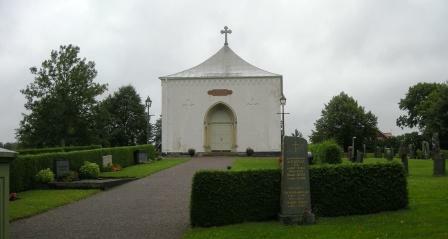 In the 12th century the first church (at least the first church built by stone) at Skärskind was built. This church was replaced by a new one in the early 19th century. The old church was then demolished except for the choir that was rebuilt and is used as chapel at the cemetery. The reason for this visit was not the chapel, though there are some medieval effects preserved within but the two rune stones; Ög 171 and Ög 172 that have been erected outside the chapel. Ög 171 is interesting as it belongs to the oldest group of rune stones, dated to the 5th or the 6th century. 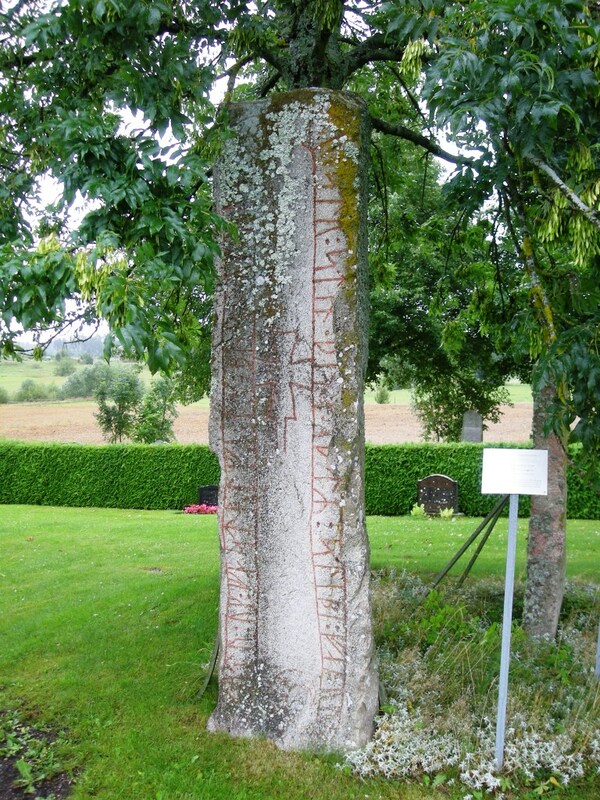 The inscription is made with the old futhork and is transliterated into skiþaleubaz which has been interpreted as a man’s name: Skinþa-Leubaz or Skinn-Ljuv. Skinn means Skin might be connected to skin (fur) trade and an addition to his surname Ljuv. Skinn might also be connected to farm/village some kilometres northwest of the church named Skinnstad. The rune stone was found during the demolishment of the old church in the 19th century so we have no way of knowing where it’s original placement has been. Ög 172 was also found as the church was demolished but this one is from the Viking Age or the early Middle Ages. On this stone the younger futhork or the Viking Age futhork has been used. The young futhork is dated from ca 800 AD and used forth. The inscription is transliterated into: kutr : uk : fastulfR : uk : burn : uk : rustin : þiR : ristu : stin : þina : i-tR : stibi : faþur : sin * kuþan which in turn becomes Gautr ok Fastulfr ok Bjôrn ok Hróðsteinn þeir reistu stein þenna e[p]tir Stybbi, fôður sinn góðan or in English; Gautr and Fastulfr and Bjôrn and Hróðsteinn, they raised this stone in memory of Stybbir, their good father. 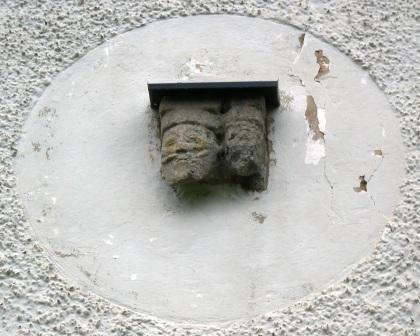 On the west wall of the chapel that does not seem to be of medieval origin at a first glance is a small Romanesque sculpture of two heads.